This article is about the block of land where John Manning and Margaret Beynon lived virtually all the time they were in Sydney. References can be found in the articles on John and Margaret elsewhere on this site. John arrived in Sydney on the ship Royal Admiral on 20 November 1800 and Margaret on the ship Nile on 14 December 1801. From a memorial by Margaret in 1810 she stated that she had lived from the time of her arrival at “The Sign of the Compasses”, No 14 South Row; later to be named O’Connell Street . From other events we know this was also the home of John Manning. On 22 August 1809, Lt Governor Colonel William Paterson granted John a lease of 45.5 rods (one rod = one perch) for 14 years at 5 shillings annual rent (reference 4D/100) . Not long after Governor Macquarie arrived in December 1809, he rescinded many decisions of the previous administration, including the lease to John Manning. Macquarie and his administrative staff then reviewed each decision and the Governor reissued the lease to John on 18 October 1811 back-dated to 1 January 1810 under the same conditions. On 11 July 1816 John signed a Deed of Gift transferring the land, house and all household furniture to Margaret as provision for her five children. What prompted this Deed is not known, but maybe John was recognising the possibility that when he died the property would transfer to a child or children of his marriage in London. But the administration continued to recognise that the lease of the land was in John’s name, that is, he did not have the right to transfer the land to Margaret as he only had a lease. John’s lease came up for review in the early 1820s for the Sydney Gazette of 26 August 1820 and 24 February 1821 advised that his lease, amongst others, would be ready on 5 March 1821. It would seem that John was not in a hurry for the Sydney Gazette of 5 July 1822 listed leases still waiting for collection, including John’s town lease. At this time the administration of land in New South Wales was in a mess. In taking steps to bring order to the process, land owners were requested to submit memorials claiming their right to own their land. A proclamation dated 8 June 1829 sought memorials from owners. 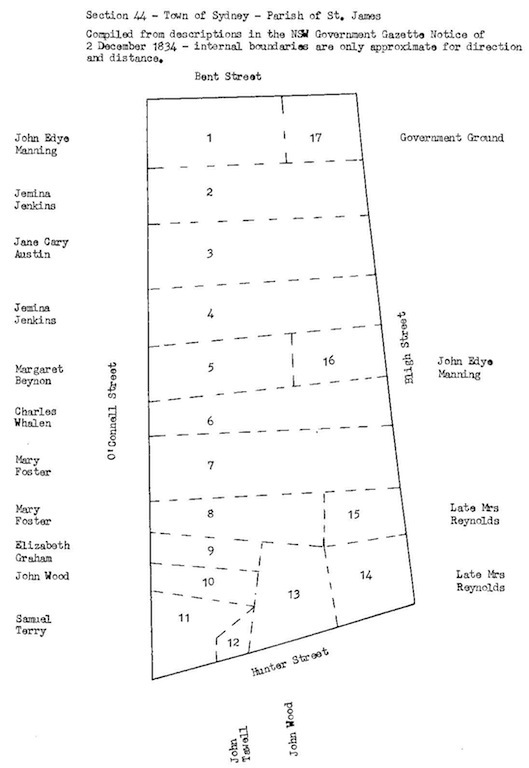 On 17 October 1831 John wrote to the Colonial Secretary, Alexander McLeay requesting that his application for a grant of the land be put before the Governor and that the grant be made jointly to himself and Margaret. This was not successful but it certainly paved the way. All memorials relating to Section 44, Parish of St James, were recognised by a lengthy notice in a NSW Government Gazette Notice of 2 December 1834, stating that unless caveats were lodged within three months, deeds of grant would be issued. On page 865 is the notice relating to Lot 5, 28 perches to Margaret Beynon, quit rent 14 shillings from 1 July 1823. The above image represents my assessment of all the Section 44 claims. The following is a list of the lots and their owners. Note - Lots 2, 3, 4, 6, 7 and 8 went through to Bligh Street. Note - The rear boundary of Margaret’s lot 5 was also the rear boundary of Lot 16. John Edye Manning does not appear to be related to John Manning. It is likely that at some prior date the rear portion of the property was transferred to John Edye Manning. The workload of reviewing and processing land entitlements was significant and took some time, for letters patent recognising Margaret as the holder of the title was not issued until 16 June 1837 for Lot 5 of 28 perches at a quit rent of one pound eight shillings per annum from 1 July 1836 to 30 June 1849, then at an annual rate of 14 shillings (Town Grant Register Vol 47, folio 73). In reviewing the names listed above it is clear that O’Connell Street was a very good location to reside in. John and Margaret would have been one of the first to erect a house in the street and therefore saw many changes over close to 50 years. Now it is a street of high rise office buildings. Rosina Elizabeth Mills, a grand daughter of John and Margaret, born in 1829, married John Henry Kable in 1850 and the following is part of her obituary from the Sydney Morning Herald on 7 August 1922. The lifetime of Mrs John Henry Kable, who died at Bathurst recently at the age of 93, spanned Sydney’s development from a humble township to a great city. Born in O’Connell-street in 1829, she paddled in the Tank Stream as a girl, and lived to see grow over that creek one of the great cities of the British Empire. Bound up with her life history are many of the most interesting happenings in the early life of the colony. Mrs Kable was one of a family of 15, and she was born in a house which fronted O’Connell-street, on the site of the present chemical warehouse of Elliott Bros, Limited. Mrs Kable in her girlhood was very fond of playing in the stream. In later years she often talked of the fine patches of corn and the vegetable gardens that then lined it, and she had a clear recollection of having often run over the bridge at about the spot where Bridge-street intersects Pitt-street. Margaret made her will on 18 August 1849 and died on 1 December 1849. It would seem that Margaret had realised she would die before John for her will allowed John to live there for the rest of his life. John died on 26 July 1850. In her will, Margaret appointed her son Charles and her son-in-law Thomas Anderson as executors and directed that the property be sold before distribution of her estate. Charles and Thomas were appointed executors by the NSW Supreme Court on 3 March 1851. “Monday, March 17 - Highly valuable city property - two very choice building allotments, in the most retired part of Sydney, O’Connell Street, adjoining the cottage occupied by Mr Evans on the northside, and about 50 feet from Mr John Smith’ s house and premises on the south, being bounded on the east by the land and houses of the Right Worshipful the Mayor, and situated about midway between the “Club House” and the “Union Bank of Australia”. To be sold by auction by Mr Samuel Lyons, at his Mart, 17th instant, at 11 o’clock precisely. Each of the above allotments has a 30 feet frontage to O’Connell Street by about 140 feet depth, and they offer most suitable sites for the erection of RESPECTABLE DWELLING HOUSES, the situation being unrivalled in Sydney for respectability and quietude, although it is in the very heart of the city. On this account it is a most excellent spot for offices of merchants or gentlemen of the legal profession. At present there is a building and outhouses upon the above land, which is about 50 feet distant north of Mr John Smith’s house, being separated from it by an allotment not built upon. The terms will be liberal. A plan is in preparation by Mr Knapp, and will be on view at the Auctioneer’s. The NSW Land and Property office holds five deeds relating to the disposal of Margaret’s property. Book 20, folio 718 dated 25 April 1851, is the conveyance of 13.5 perches from Thomas Anderson, of Lane Cove schoolmaster and Charles Manning of Sydney carpenter, to William Thurlow of Sydney Esquire who bid 345 pounds at the auction. This was the house block. Book 20, folio 719, dated 28 April 1851 is the conveyance of 13.5 perches from William Thurlow to Charles Manning for 260 pounds. Book 22, folio 51 is a conveyance dated 25 April 1851 transferring title from Thomas Anderson of Lane Cove, Schoolmaster and Charles Manning of O’Connell Street, Carpenter, to Abraham Cohen of Castlereagh Street, gentleman. Abraham Cohen had bid 300 pounds for one lot of 14.5 perches. This is the southern portion of Lot 5; the dimensions being 30 feet along O’Connell Street, 139 feet 3 inches on the southern boundary, 28 feet on the eastern boundary and 135 feet on the northern boundary. Book 20, folio 862 dated 21 May 1851, is a mortgage of 13.5 perches being part of Lot 5, Section 44. Margaret’s son and executor Charles Manning, carpenter and joiner of O’Connell Street had arranged for a loan of 60 pounds sterling from John Dunsmore and Alexander Longmore, gentlemen of Sydney. The loan together with interest at 10% being due to be repaid in equal half yearly instalments by 21 May 1852. Book 23, folio 472 is a conveyance dated 26 July 1852 between Charles Manning of O’Connell Street, carpenter and John Dunsmore of Sydney, gentleman, and Robert Johnson of Sydney, gentleman. Title to the land of 13.5 perches passed to Robert Johnson on payment by him of 60 pounds to John Dunsmore in discharge of the mortgage (interest having previously been paid by Charles) and payment of 360 pounds to Charles. This is the northern portion of Lot 5; the dimensions being 30 feet along O’Connell Street, 135 feet on the southern boundary, 28 feet 3 inches of the eastern boundary and 132 feet on the northern boundary. This then completed the Manning connection to 14 O’Connell Street, Sydney from 1801 to 1852, although it is possible that Charles then rented the house until he and his family moved to the south coast of New South Wales.